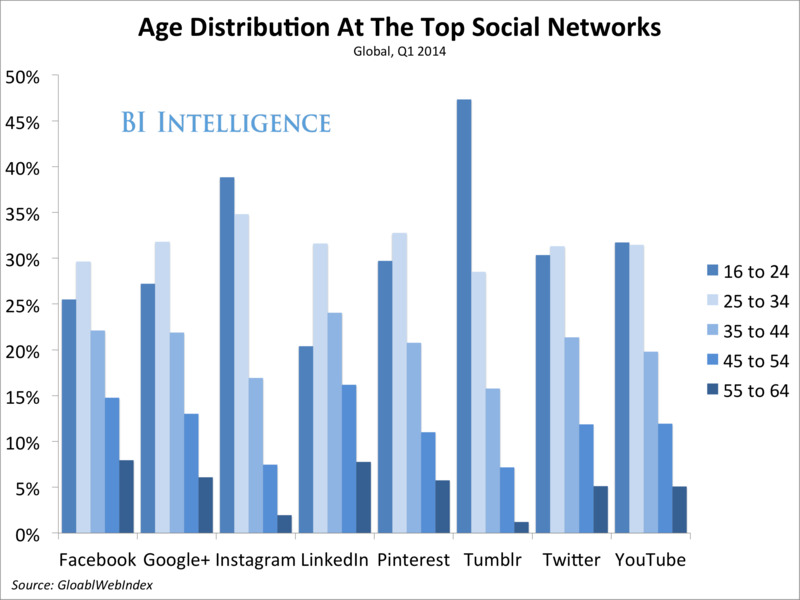 Social networks continue to be popular with teenagers, but their largest group is actually a bit older. 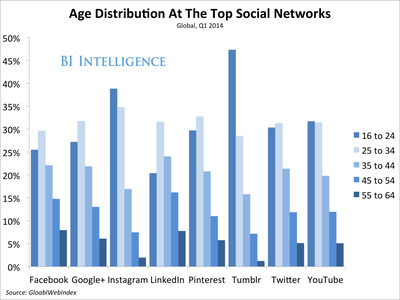 At some of the biggest social networks like Facebook, Twitter, Google+, LinkedIn, and Pinterest, the largest share of the user base comes from internet users in their late 20s and early 30s, according to a new report from BI Intelligence. This changes when you look at relatively newer social networks, however. Social networks like Instagram, Tumblr, and YouTube attract a younger demographic, with the largest user base coming from internet users aged 16 to 24. Tumblr, in particular, is incredibly popular among teens and early 20-somethings, with almost 50% of its user base between the ages of 16 and 24. Interestingly enough, both Tumblr and Instagram also have the lowest share of older users, with less than 5% of their user base coming from internet users aged 55 to 64. Even though social networks are already incredibly popular with teens and millennials, social networks are still seeing user growth from these demographics. In the US, for example, 18- to 29-year-olds actually increased their adoption of Facebook, Instagram, Twitter, Snapchat, Google+, Pinterest, and Tumblr between the fall of 2013 and the spring of 2014. For full access to all BI Intelligence reports, briefs, and downloadable charts on the digital media industry, sign up for a two week trial.